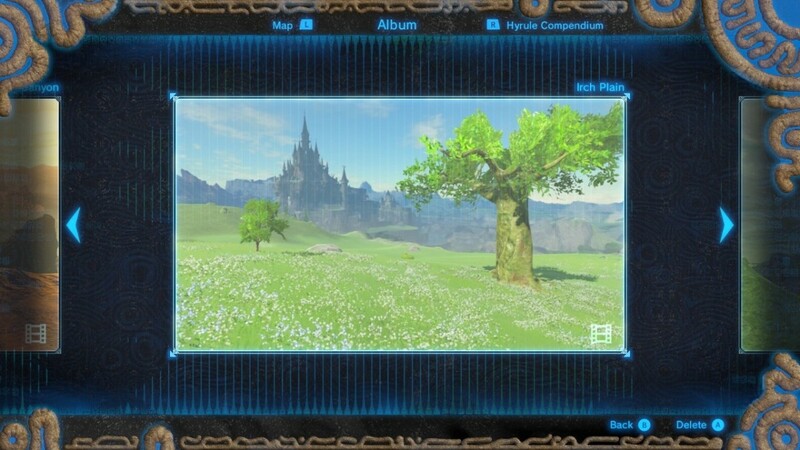 The Captured Memories side quest is one of the main side quests in The Legend of Zelda: Breath of the Wild. 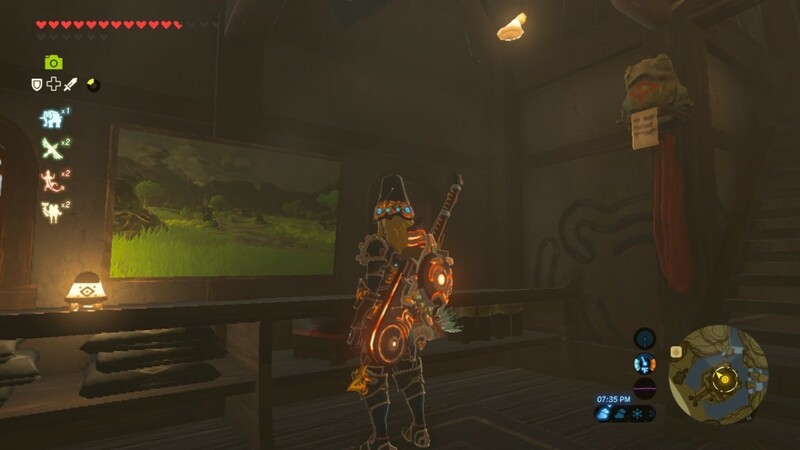 If you find one memory and then return to Impa in Kakariko Village, you earn the blue Champion's Tunic, which offers a higher level of protection than other tunics and allows you to see an enemy's full HP. 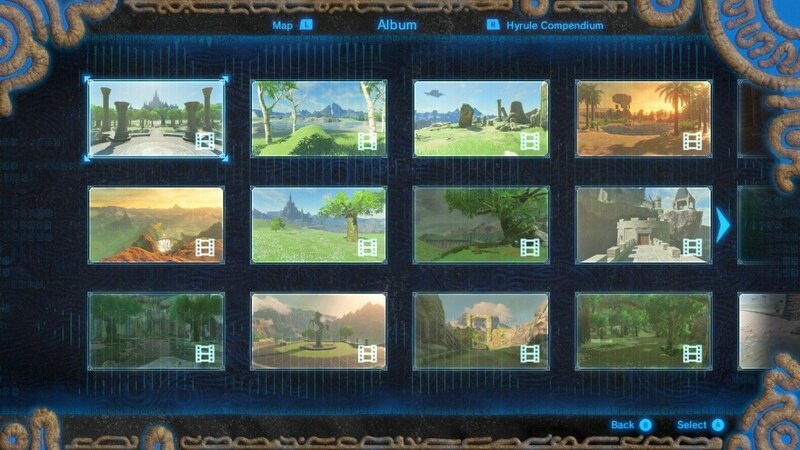 Finding the other memories isn't essential, but it gives you a lot of story background and fun clips, and then allows you to unlock a final memory that isn't revealed by Impa until you find the first twelve. 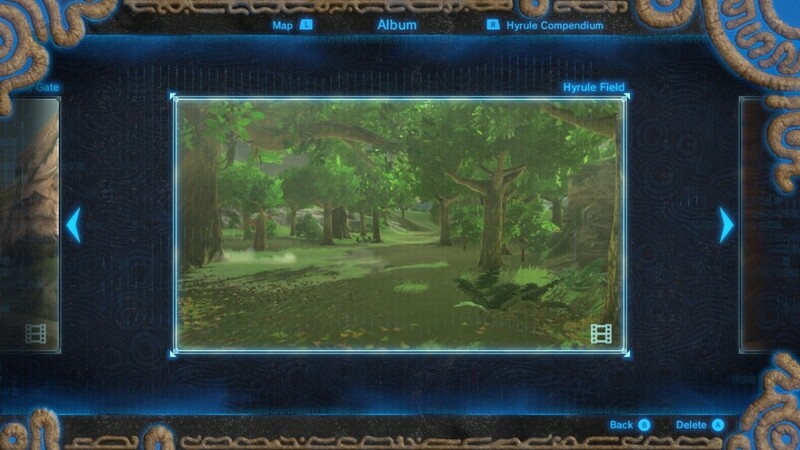 Locating all of the memories also gives you an extended ending after you have beaten the game. 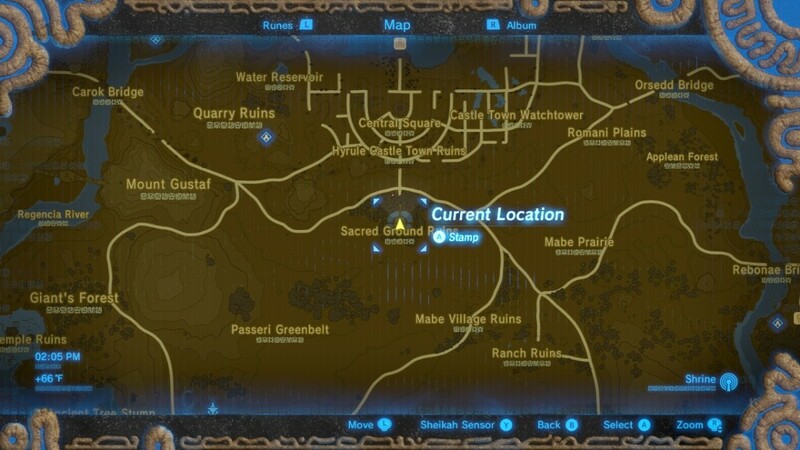 Below, you'll find maps and tips for locating all memory locations, including the final memory. 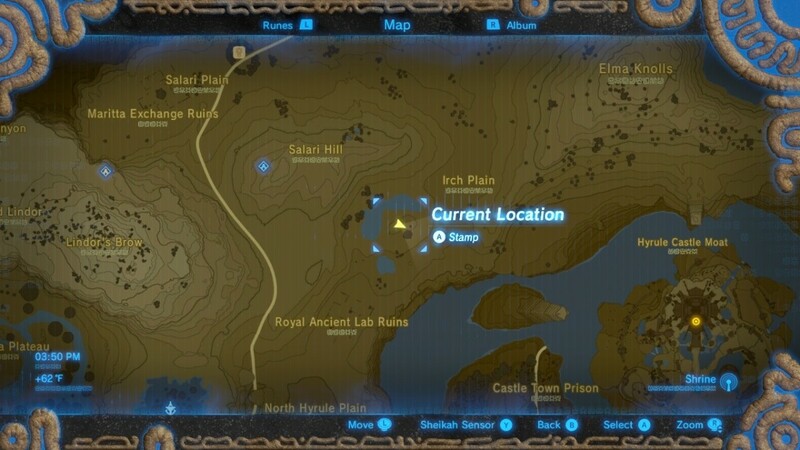 This might be difficult to get to early in the game as you need to sneak past a few guardians, but you'll find it in the northwest area of Hyrule Field before you get to the castle (see map below). 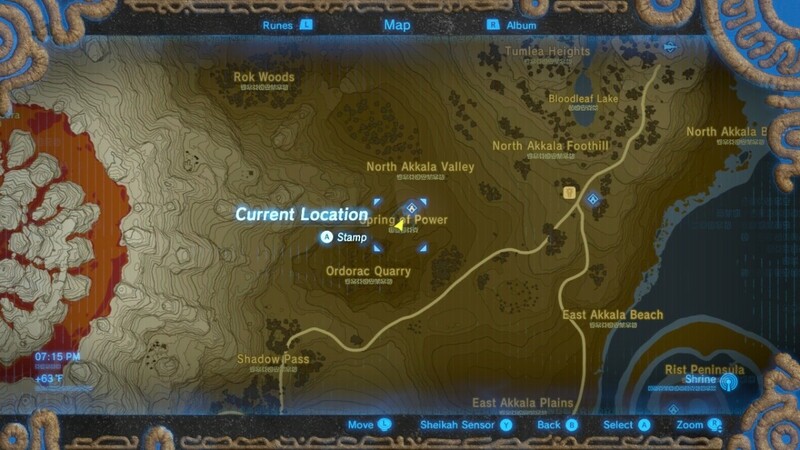 The easiest way is to activate Central Tower so that you can see it on the map and then glide part of the way over to it. 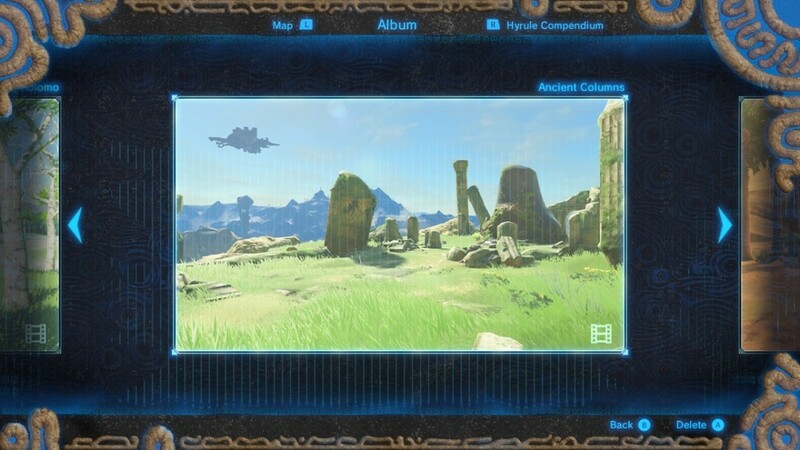 But again, the guardians make this task difficult without upgraded armor and, most importantly, ancient arrows, which you can purchase at the Akkala Ancient Tech Lab (located in the upper-right corner of Hyrule) once you have completed the side-quests there. 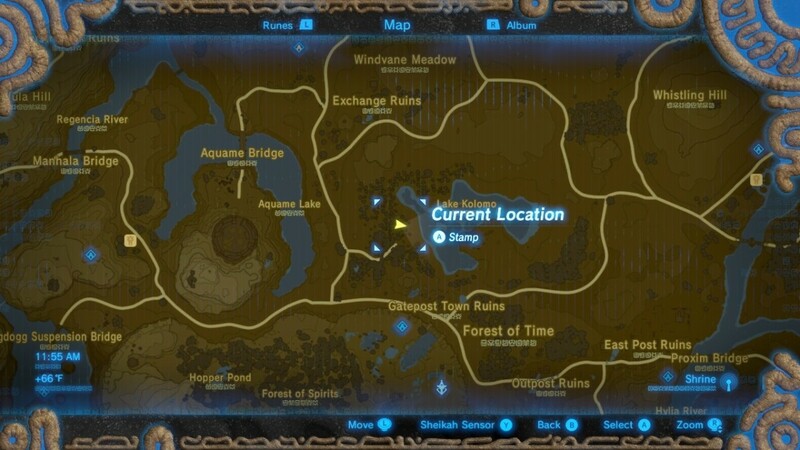 Lake Kolomo is very easy to get to from the Great Plateau. 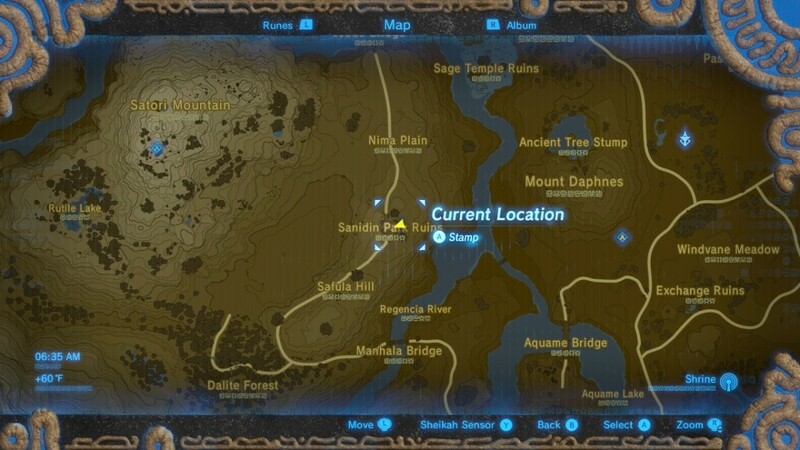 Teleport to the Oman Au Shrine on the Great Plateau, and then glide north toward the area shown on the map below. 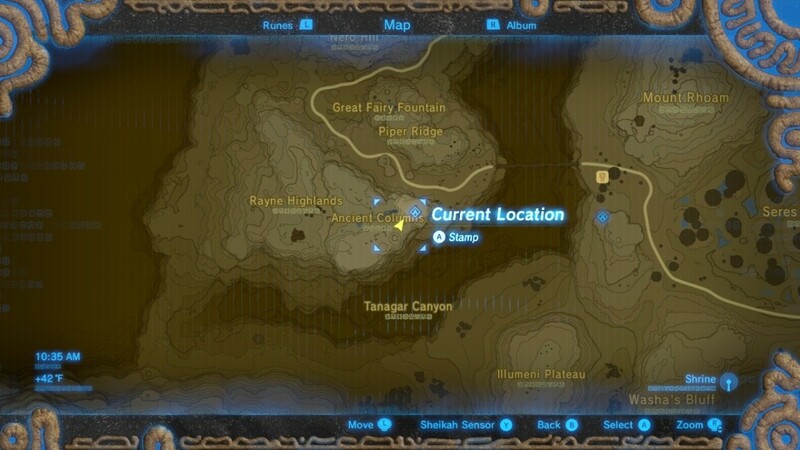 To find the Ancient Columns, head northwest from the Great Plateau on the road that takes you past Outskirt Stable. Travel west across Manhala Bridge (Regencia River), and then take the right-hand fork in the road north at Dalite Forest. 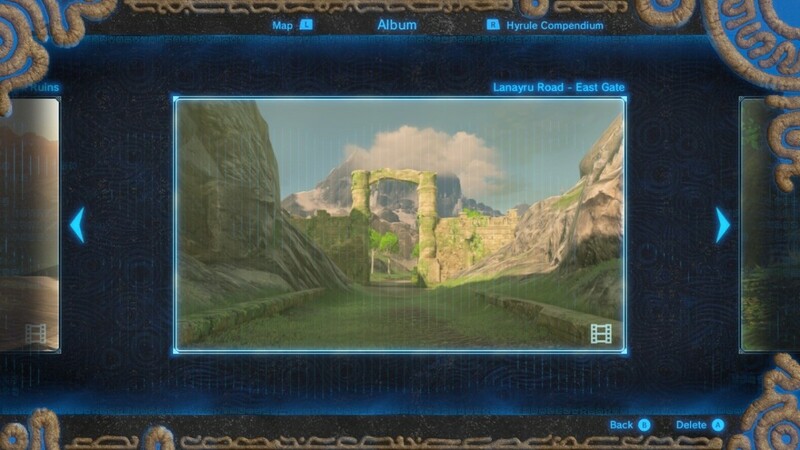 Keep heading north, and you should come across Jeddo Bridge, which leads into the Hyrule Ridge area. At the fork in the road, head west and keep proceeding along the road in this direction until you come to Tabantha Bridge Stable. Cross Tabantha Great Bridge (which spans Tanagar Canyon), and the columns will be up on your left. *Note that you will also pass the Sanidin Park memory along this path--see #10 below. Finding the Kara Kara Bazaar is very straightforward. 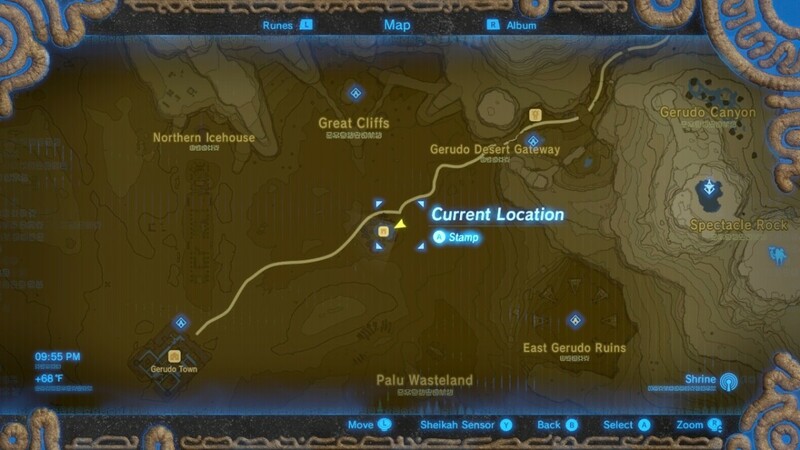 Simply head out to the Gerudo Desert (bottom-left hand corner of Hyrule) taking the main road that begins to the west of the Great Plateau and winds through a canyon, and you'll run right into it shortly after entering the desert. Finding the Eldin Canyon location can be tricky. I suggest beginning by gliding to the east/southeast from Woodland Tower. Try landing in the grassy area that begins heading up the mountain. Scramble up to find the location (up and to the right of this grassy area), checking back as you go. 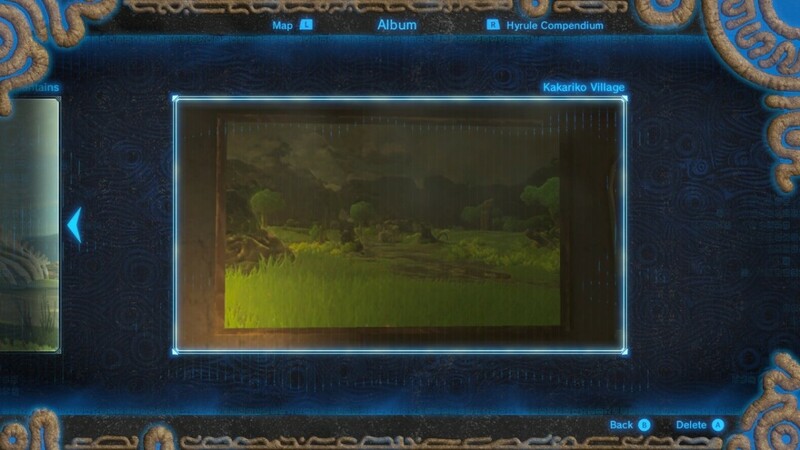 You will find it next to a Korok puzzle (see pic below), which helps. 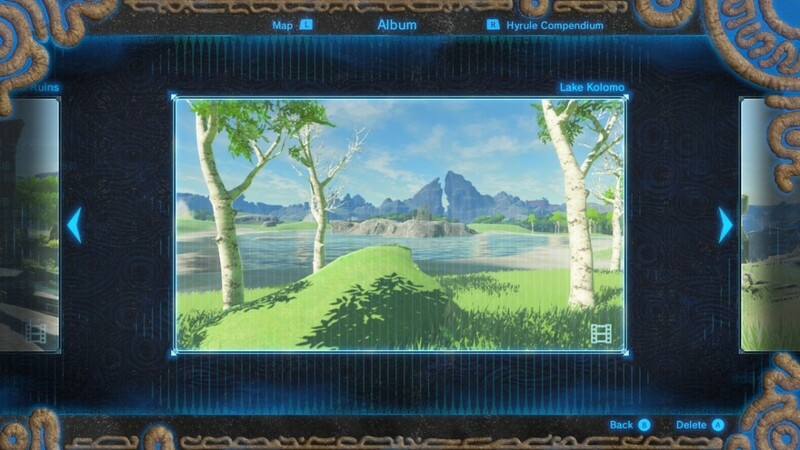 Also consult the screenshot of Link looking back at Woodland Tower from the memory location. 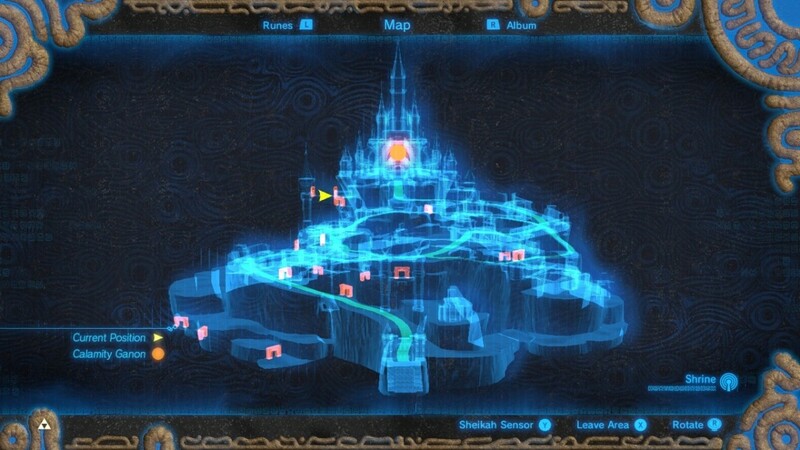 The Irch Plain memory is located north-west of Hyrule Castle. Simply consult the map below and look for the tree. 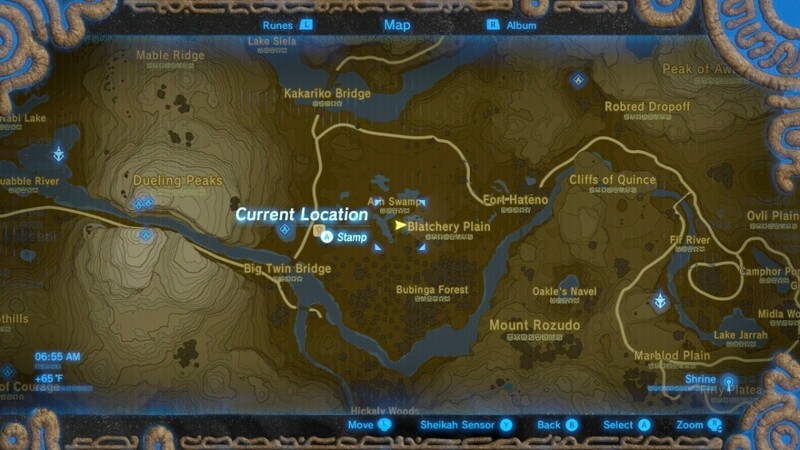 For this location, head south along Hylia River from Proxim Bridge to the area you see on the map (before you reach Lake Hylia). 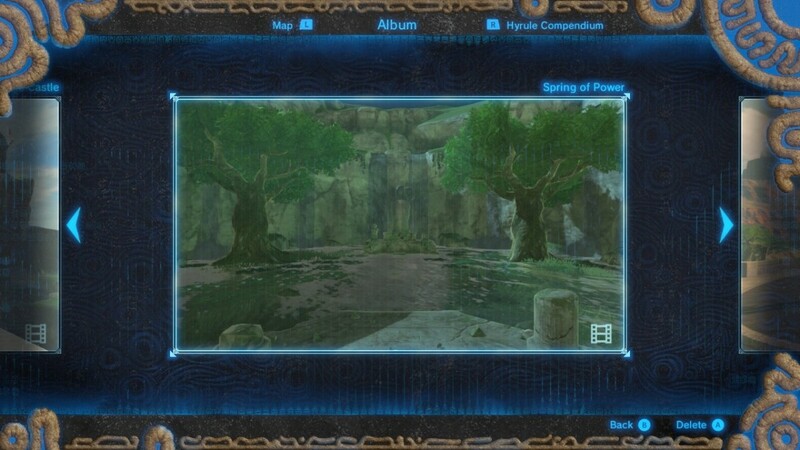 It's located between Hylia River and the Deya Village Ruins--just look for the tree and Korok statue offering in the photo. 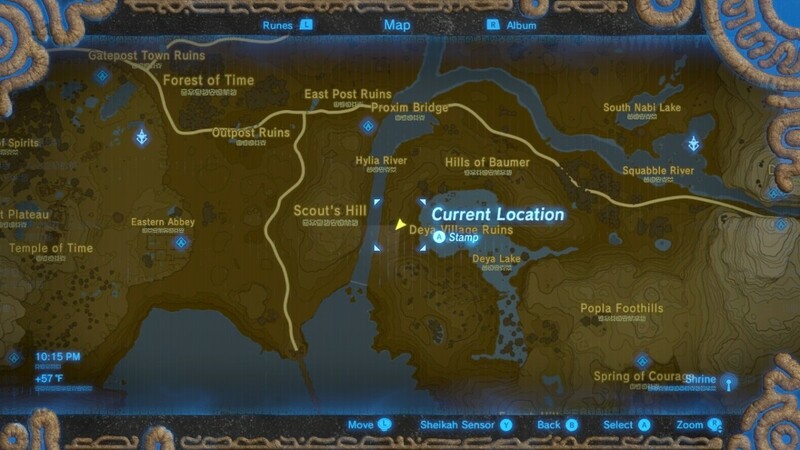 This is probably the most challenging location to get to early in the game as you, naturally, have to enter and navigate through Hyrule Castle, which is swarming with guardians and other enemies. Consult the castle image maps below for the exact location (yellow triangle). 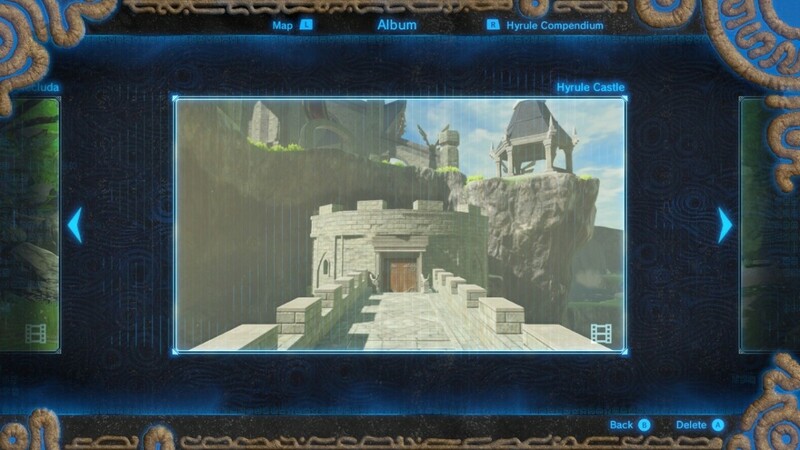 It's located up on a bridge that spans from a tower to the main castle (and Zelda's room) on the northwest side of the castle. If you try to cross the moat here, look for openings to a mine near the bottom of the castle. And be sure to load up on stamina meals if you do not have a lot of stamina for swimming or climbing. 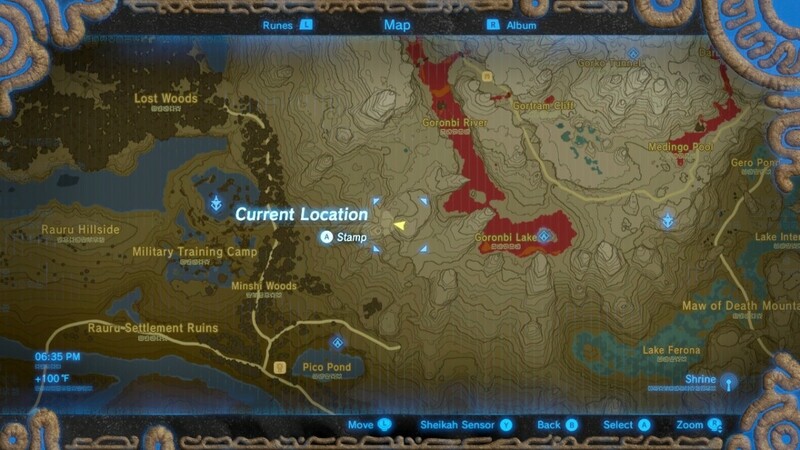 Simply consult the map to find the Spring of Power in the Akkala region. I suggest entering from the east or north sides to avoid the guardians to the south of the spring. 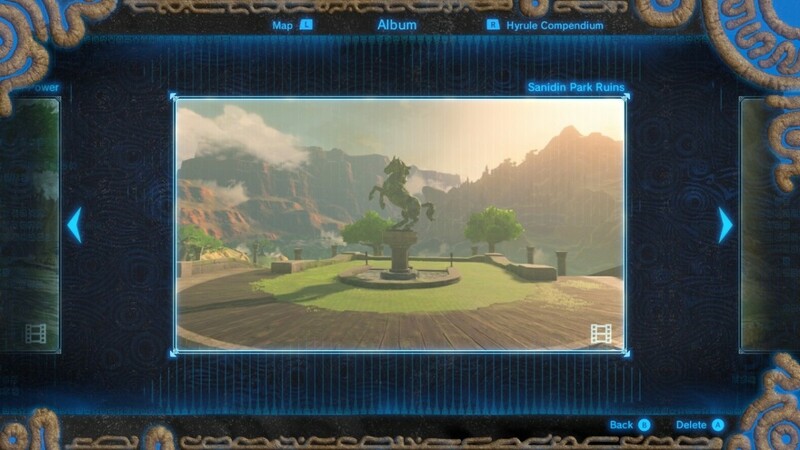 While you're at it, bring a shard of Dinraal's scale to activate a shrine here. Simply follow the directions to the Ancient Columns and you will ride right past Sanidin Park after crossing Manhala Bridge and heading north (it's just north of Safula Hill). 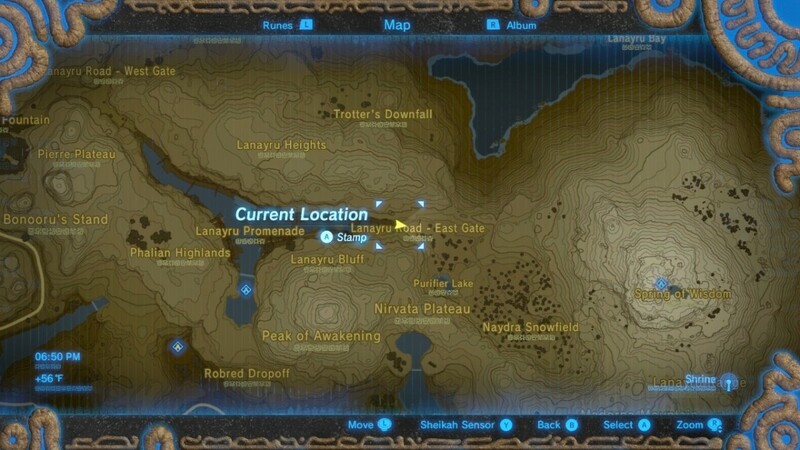 You will easily notice the shape of the canyon on your map (Lanayru Promenade). 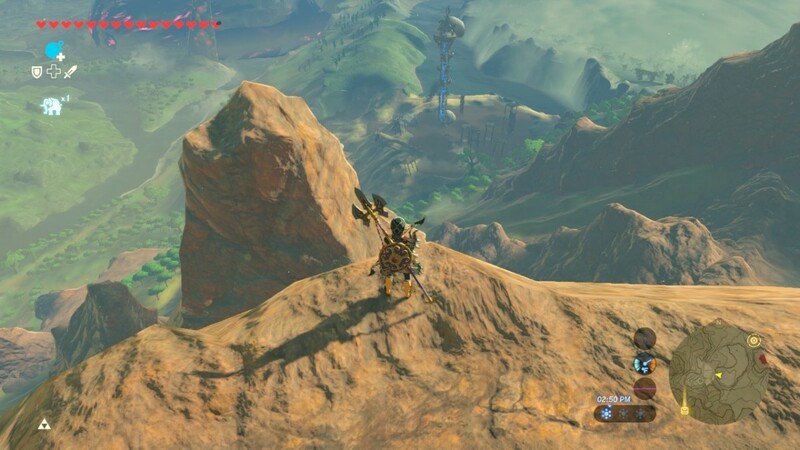 You can either approach from the west, heading eastward from Kakariko Village (the easiest), or glide down from Mount Lanayru if you have activated the shrine here. 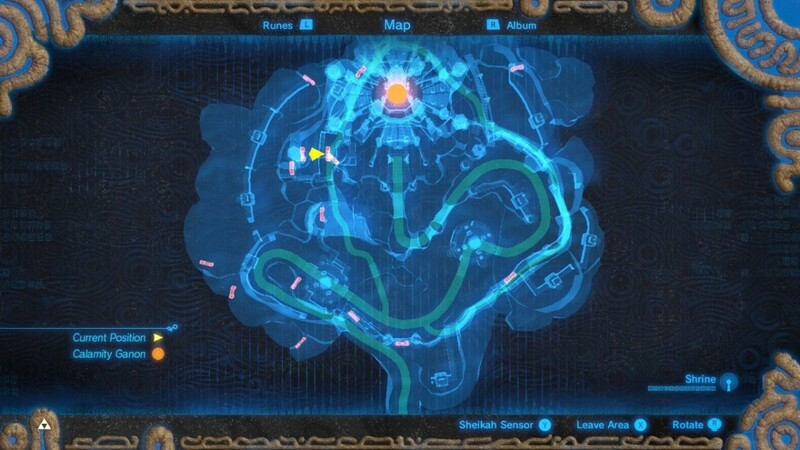 Alternatively, you can glide northwest from the Hateno Ancient Tech Lab to the Naydra Snowfield and make your way from there. 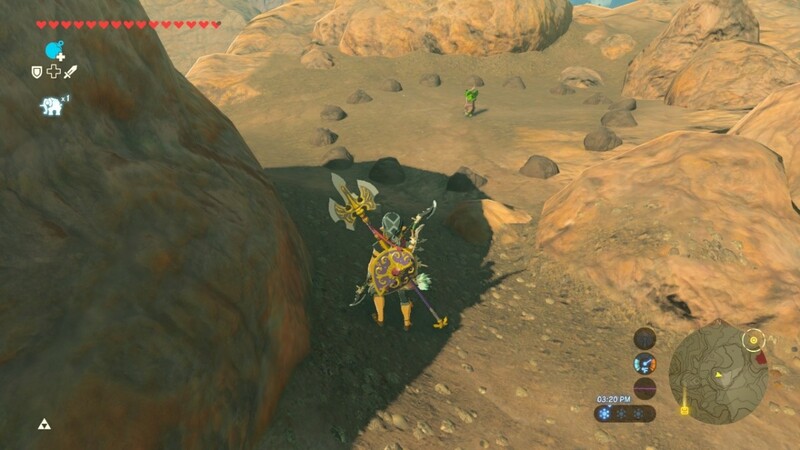 As a warning, there is a Lynel in your path once you cross the snowfield, so stay up high. 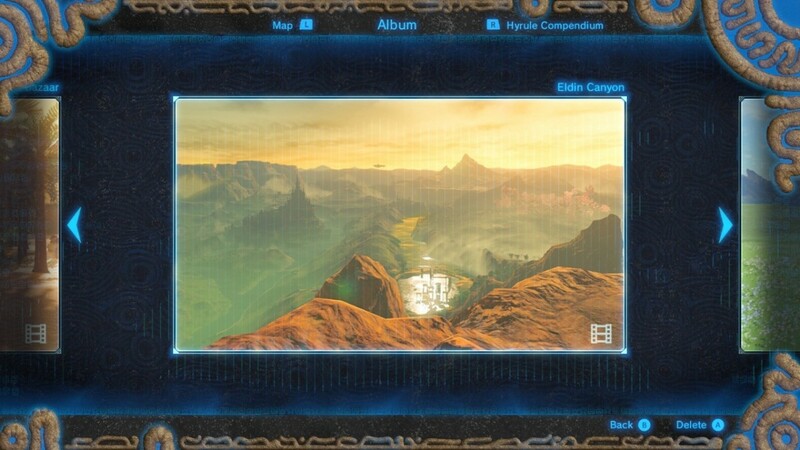 If you proceed from Kakariko Village, you will also want to stay in the hills until you reach the East Gate as the canyon is filled with enemies. If you really want a challenge, try finding this one without a guide. It's definitely the hardest to find, but the shrubbery and apple tree gives regional clues. 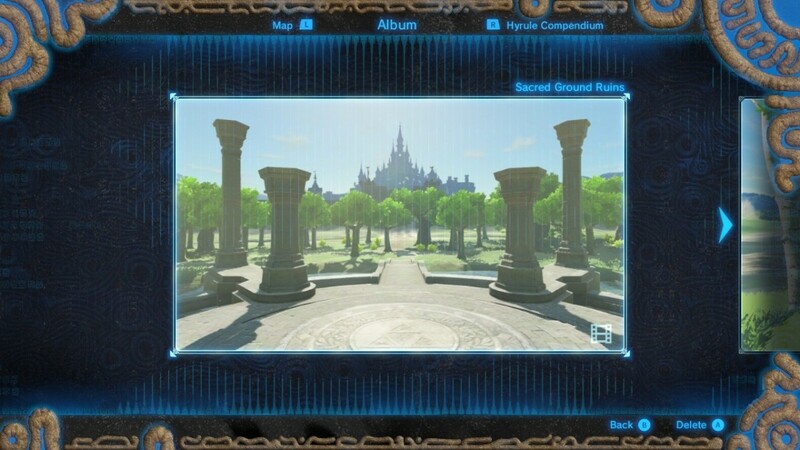 You will find this location in the southeast area of Hyrule Field. 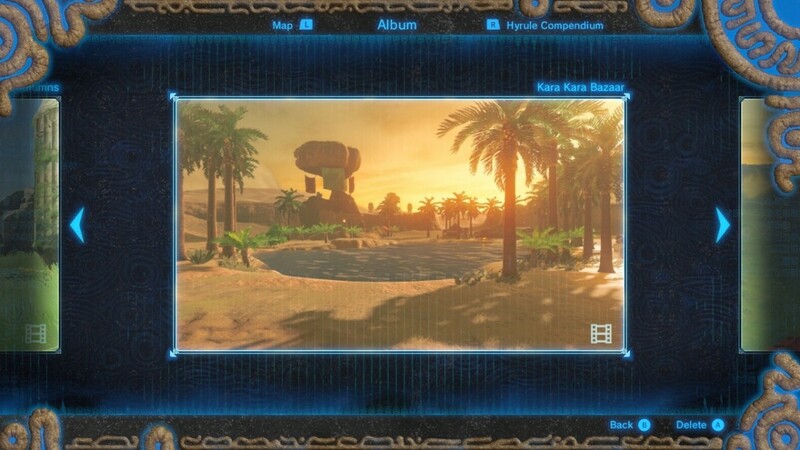 If you have activated Kaya Wan Shrine next to Wetland Stable, travel here, and then cross Hylia River to the southwest. Before you reach the Bottomless Swamp, you will find a wooded area. Proceed to the yellow triangle marked on the map below. Simply find the path that goes through the forest here to find the glowing memory location. 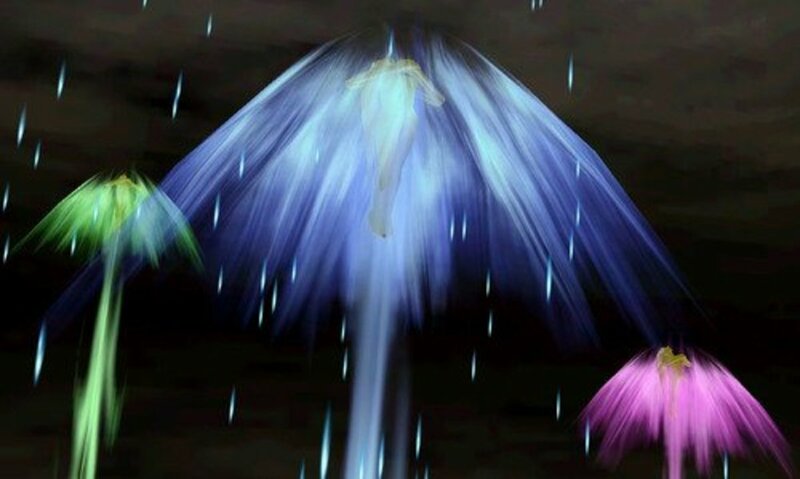 Once you have located all twelve memories, head back to Impa and she will reveal a final, thirteenth memory. 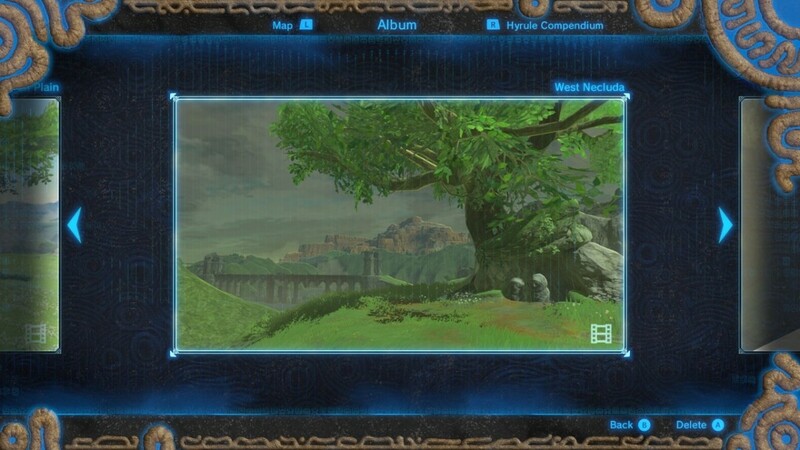 Take a snapshot of the picture she shows you on her wall so that you will have it with you, then journey to the location on the map below (in Necluda where you came across Dueling Peaks Stable). Amidst the guardian corpses in the middle of this area, you will find the glowing spot for the final memory. 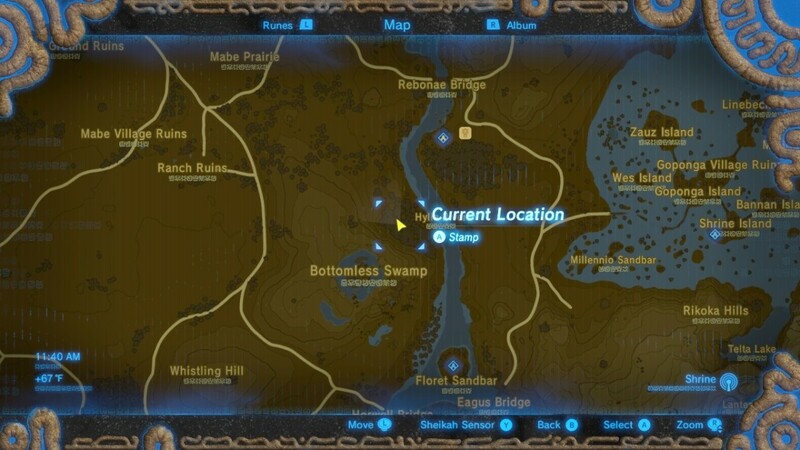 Note on the mini-map in the screenshot below that it is located in the "mouth" of the a blob of water in Ash Swamp. 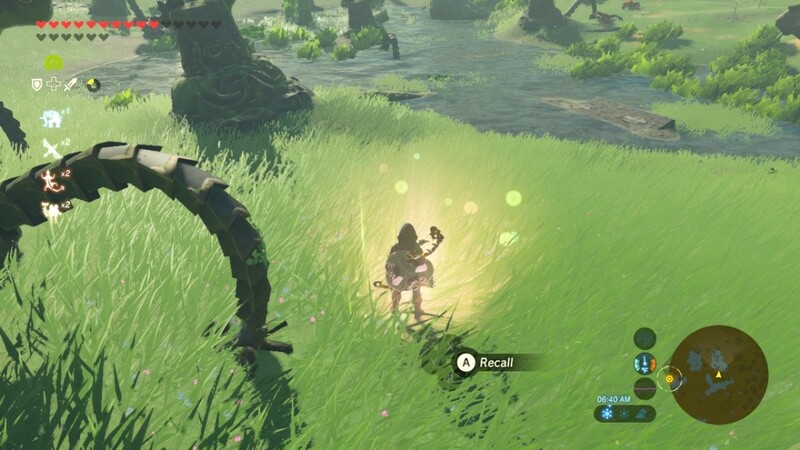 Other than the Master Sword, are there any other OP weapons in "The Legend of Zelda: Breath of the Wild"? How old is Mipha in Legend of "The Legend of Zelda: Breath of the Wild"? In Breath of the Wild, is prince Sidon a boy or a girl? 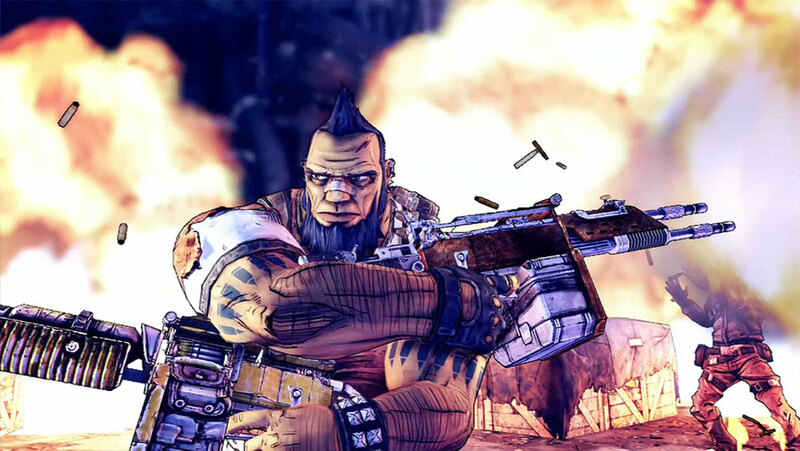 Have you, the author of this article, made other video game guides? 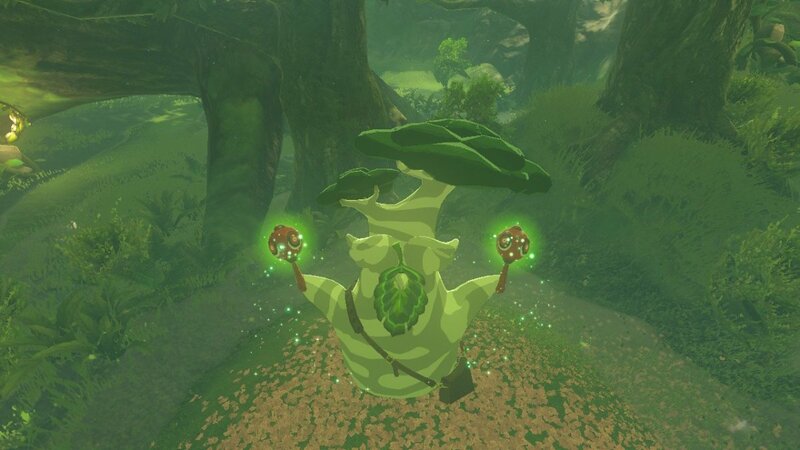 Christianity in "The Legend of Zelda"? 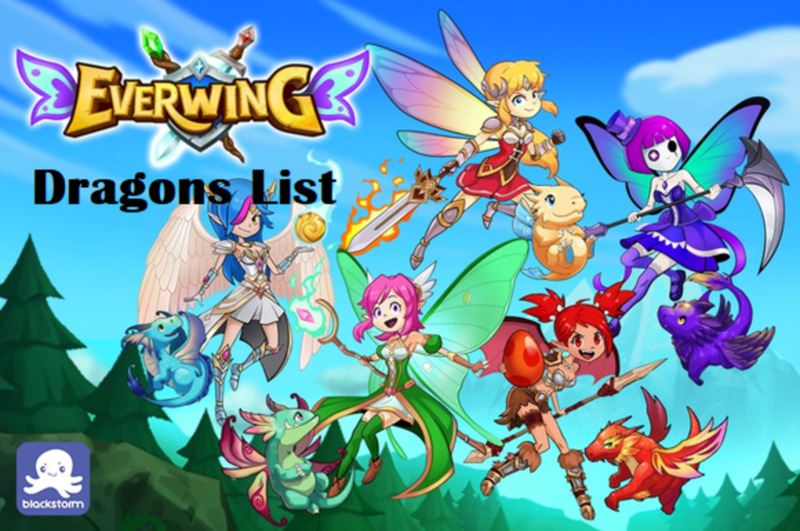 Fantastic guide! Even when asking Pikango, it's hard to find all the locations. I really enjoy lore and stories in games so I was hoping to track down all the memories. Thank you!